Visiting Paris, or much of Europe for that matter, in August as we did is often met with a cautionary tale from seasoned travelers. Europeans typically take a more coordinated vacation in the month of August leaving magnetic cities such as Paris with some restaurants and shops shuttered for holiday. One will also find themselves in the company of more tourists than Parisians in certain localities, and certainly traditional venues such as the Louvre are bursting at the seams with international tour groups. When I was told not to visit Europe in August because ‘everything is closed’ I felt it was not only a ridiculous notion but candidly I feel ANYTIME one can visit a city like Paris they should jump on it. For all the businesses that are ‘en vacances’, plenty more are open, as are the traditional sights and museums and there is still a magical time to be had. 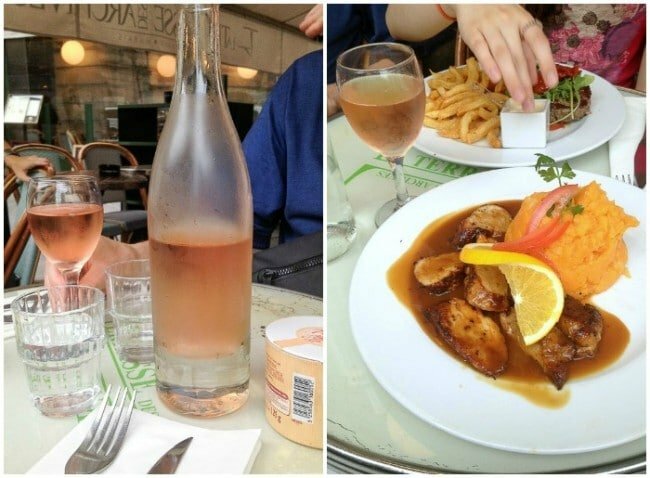 I struggled with what to name this post as I believe one could live in Paris for years and still not scratch the surface of all the eateries available. This is truly a chronicle of our experience, favorite dining finds where gluten-free options were found, and the ‘next time’ list of those eateries which were closed during our stay. 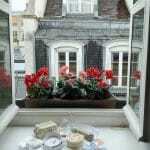 We were staying in Le Marais, the 3rd-almost-the-4th Arrondissement on Rue de Temple. The area is a hot bed of café’s, evening dining spots and even a ‘cat café’ where coffee-drinking patrons may sip a latte in feline company (however we read one is not allowed to disturb or touch the cats). There are an abundance of street cafes and fortunately for us, cafes which were familiar with gluten-free dining. Due to travelling ‘avec famille’ (with family) and with a haphazard schedule we did not make dinner reservations and dine out more formally. 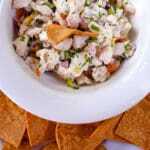 We did research and seek out restaurants with great reviews also offering a more casual dining experience. 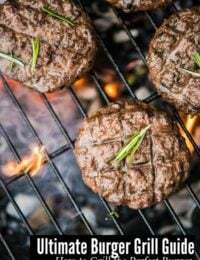 Being mid-August we also found restaurant websites not updated for vacation closings, nor any messages on their voicemail greetings. We showed up early and hungry a few times only to learn (once from a painter working inside) that there would be no dining there. Bustling Cafe Marianne in the Jewish Quarter of the Marais. As fortunate as we felt to be able to usually seek out and plop down at a café wherever we were to have a drink or dine, we noted about halfway through our trip we really had not had any food that was remarkable; that kind of meal that stays with you as does a cherished souvenir. My husband became friendly with a man at our neighborhood wine shop after a few daily visits. 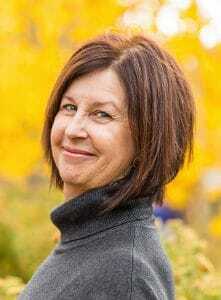 They both had traveled abroad extensively and shared the love of food. After a lengthy conversation about food one evening, my husband asked for advice about where to find really good food in the area. 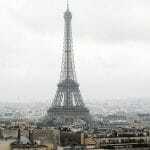 The gentleman confessed that Le Marais had become such a tourist mecca that is was more difficult to find. He suggested a few restaurants, where we’d expect to find mainly French locals and those are listed in our ‘next visit’ list at the end of the post. 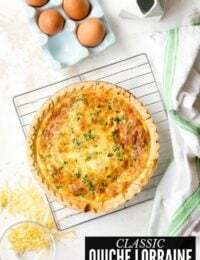 We found traditional French dishes at every café we visited and there is no denying the romance of sitting facing a busy street with French being spoken all around and the feeling that you can sit there as long as you choose. In that respect every meal was enchantingly memorable. 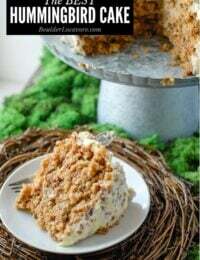 We did find some fun places that I wanted to pass along recommending them for a visit. My personal spin on a thirst quenching French cafe sipper: Citron Presse. 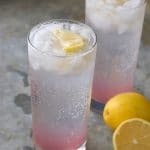 Unlike American lemonade which can be almost sickly sweet with sugar, French Lemonade is a wonderful blend between clean lemon flavors, lightly sweetened with a lemon-lavender simple syrup. 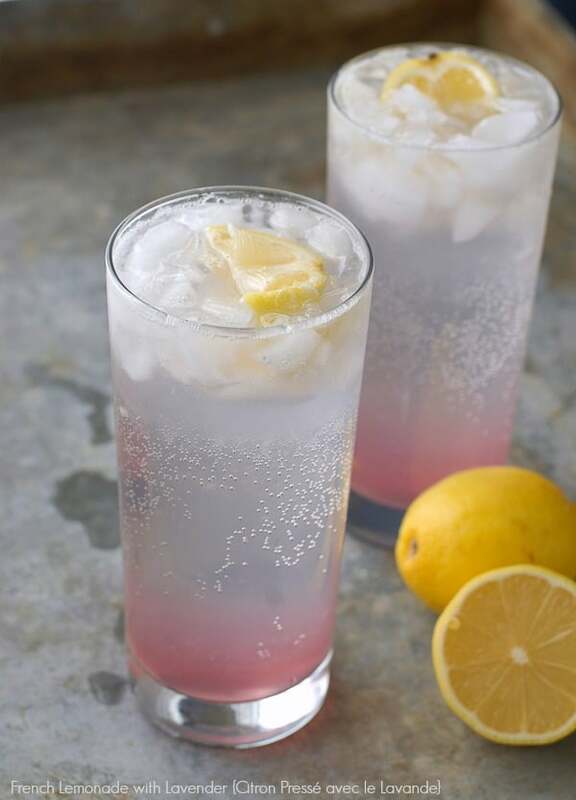 Ingredients can be tailored for one's personal taste.The Lemon-Lavender Simple Syrup need not be limited to this lemonade. It would be wonderful in light cocktails as well. Combine all ingredients for the syrup into a medium saucepan and bring just to a boil over medium-high heat, stirring to dissolve sugar. Remove from heat. Allow to sit/steep for one hour. Strain mixture through a fine-mesh seive and discard the lavender and lemon zest. Store sealed in the refrigerator for use. In a highball glass, combine 2 tablespoons Lemon-Lavender Simple Syrup and 2 tablespoons freshly squeezed lemon juice; stir. Fill the glass with ice. Fill with sparkling (my preference) or still water. Garnish with lemon if desired. TIP for Ordering Water at a Café: At our first café I ordered a small bottle of ‘L’eau sans gaseuze’ (uncabonated mineral water). It offered about 2 ½ cups of water total. Elated that I was able to actually get what I’d hoped I was asking for in French, I ignored the price which my husband shared later was more than the large beer he’d ordered. 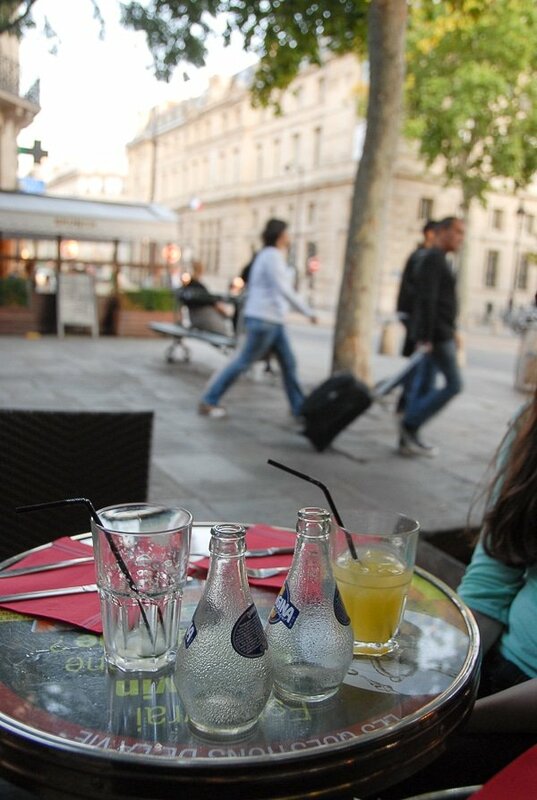 Tap water is safe to drink in Paris and unless you have your heart set on bottled mineral water (avec gaseuz or sans) order a simple carafe of cold tap water: ‘Une carafe de l’eau’ (oon carahfe duh low). 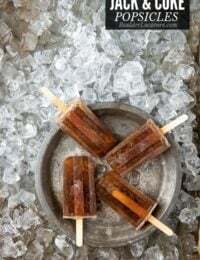 It’s a budget friendly way to quench your thirst. The Strada Cafe is included on all the ‘best coffee in Paris’ lists and is secreted away on Rue de Temple across the street from our apartment entrance. They are open from early morning to afternoon, serving delicious coffee (and hot chocolate) drinks along with breakfast and lunch options. The cafe houses about 8 tables and only few food options but those they serve are thoughtful and inspired. 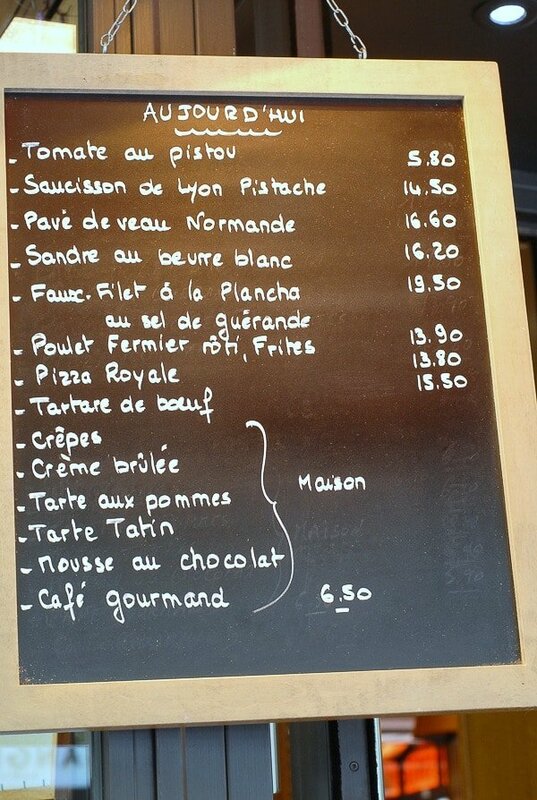 Café Strada (Marais). This tiny café was across the one way street of Rue de Temple from our apartment. It is touted to have some of the best coffee in Paris as well as a few dishes each for breakfast and lunch (it is open from 6 a.m. to mid-afternoon only). Though I would not say the food was traditional French it was some of the most inspired, innovative food we enjoyed. 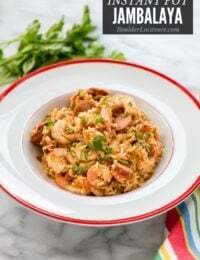 Bold combinations of unexpected flavors and made by someone who loves food and embeds that love in their original dishes. One orders at the counter (very hospitable to non-French speakers) and the food is delivered to one of the café’s six tables. The café is full mainly of locals and visitors are definitely welcome. A local gem. 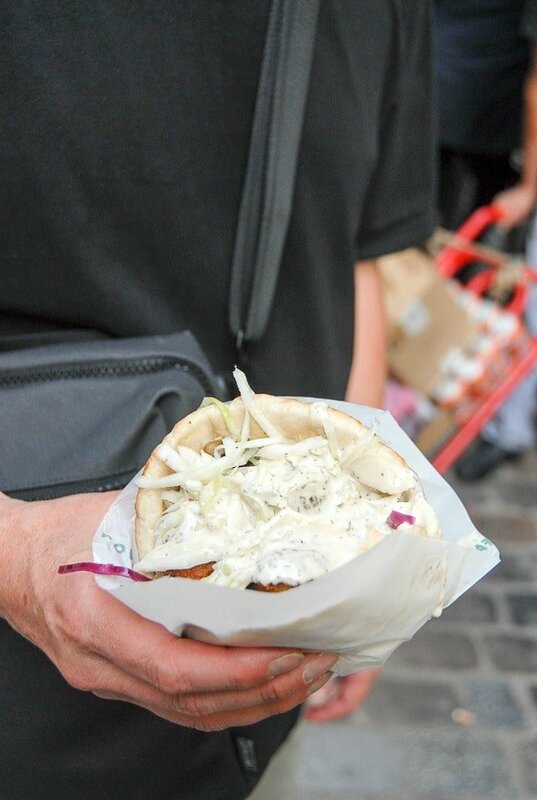 L’As du Fallafel (Marais – Jewish Quarter). 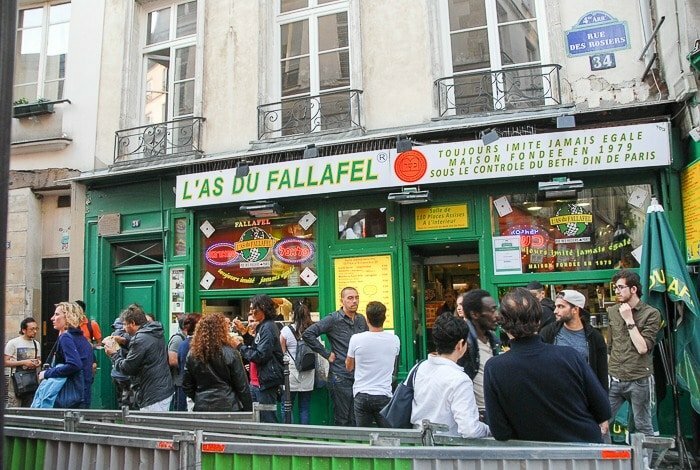 Though not a stop for a gluten-free diners, we became obsessed with visiting L’As du Fallafel; a falafel shop recommended in every dining guide and by every noted luminary with their finger on the pulse of Parisian ‘must dine’ spots. It was closed for vacation when arrived in Paris but fortunately opened before we left. One would not be able to distinguish the restaurant from all the other falafel places next door or across the lane with exception of the long line. I mean, really, really long line. There is a two part process to order. Looking at the restaurant photo above, one first approaches the area on the right to order. If you will take the falafel to go, they fill out a ticket which is taken to wait in the line on the left side of the restaurant front. The line moves quickly and the options are very streamlined. My husband was our taste tester and gave thumbs up to the ample, juicy falafel. The several surrounding falafel restaurants had no one in line. Clearly there is something special about this place. Helmut Newcake. 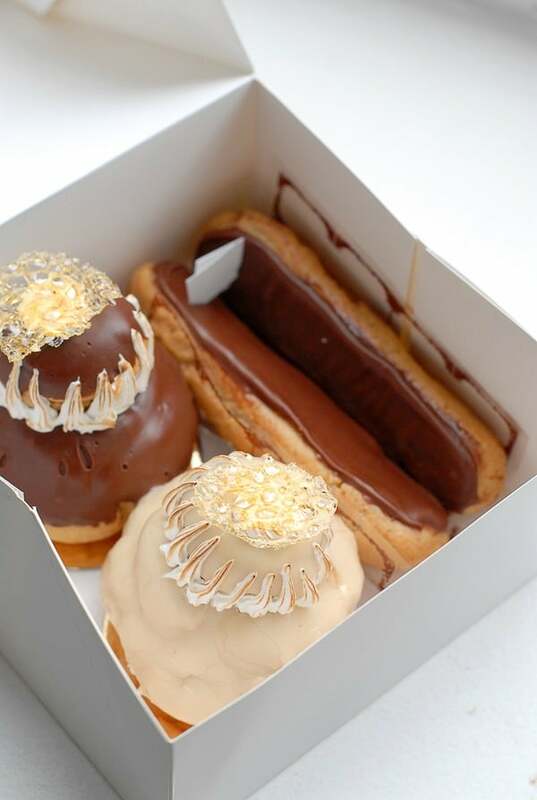 I think most people associate Paris with decadent pastries however for we gluten-free it would not be something we could enjoy. Not the case thanks for Helmut Newcake. Breaking the gluten-free mold Helmut Newcake serves up the most extravagant, sumptuous delicacies that all the gluten-consuming kids are eating. A feast for the eyes and most certainly for the palate, this was a high point for us. 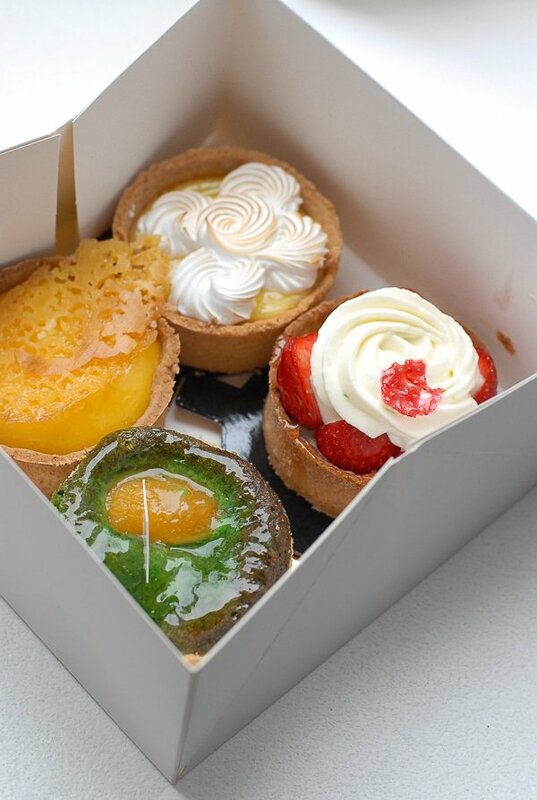 About a twenty minute walk from our apartment to Rue Bichat, they offer pastries to go, eat in, as well as many other gluten-free staples from Europe and the U.K. we had not tried before (pasta, cereal, etc.). They have a wonderful crusty gluten-free bread that is heaven and perfectly paired with local cheeses. The small venue also hosts in house dining for brunch or lunch. Café Hugo (Hôtel-de-Ville). On a wandering exploration of Marais, after visiting the Musée Carnavalet we found ourselves at the Palace des Vosges formerly the residence of the royals before moving out to Versailles. We popped in to Café Hugo for a drink. The notable author of Les Misérables and The Hunchback of Notre Dame spent much of his time in Paris in early 1800’s in this very spot. 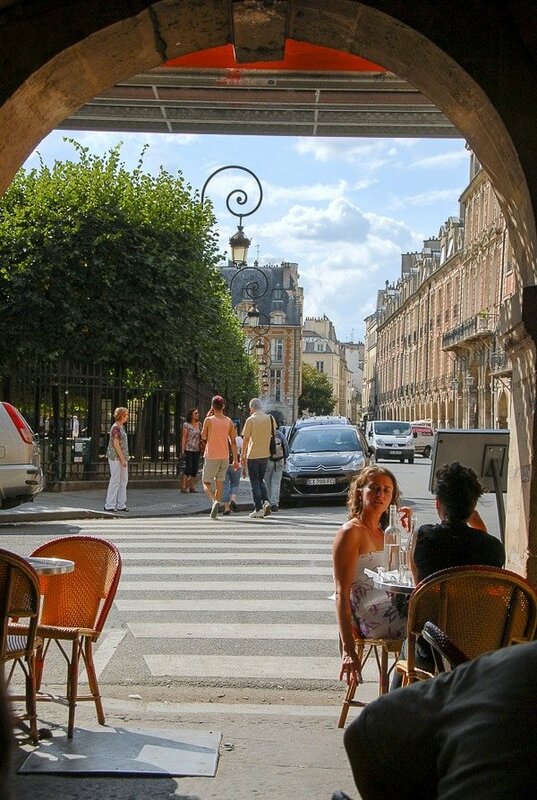 The café is positioned perfectly to look out of the architectural arches to the square, recalling the once most coveted neighborhood of the Paris aristocracy. Café Hugo is reputed for slow service and we experienced the same however in turn you are not rushed to finish up and move along. 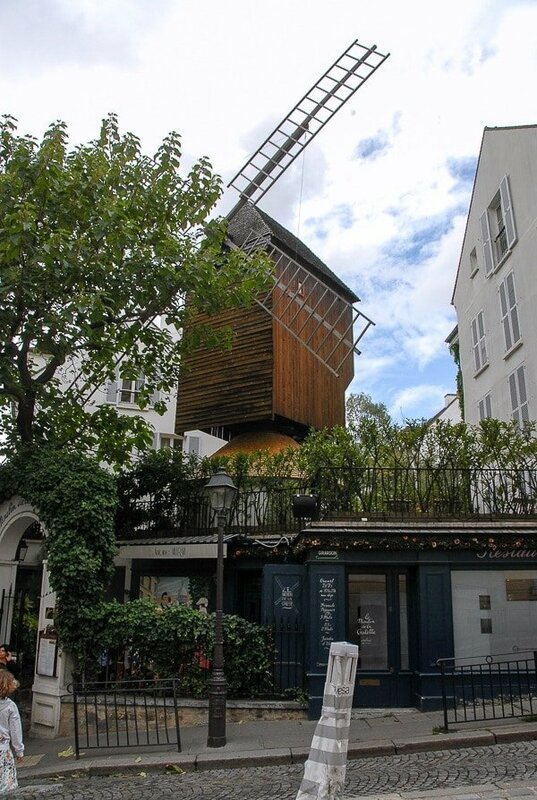 Le Moulin de la Galette (Montmartre). 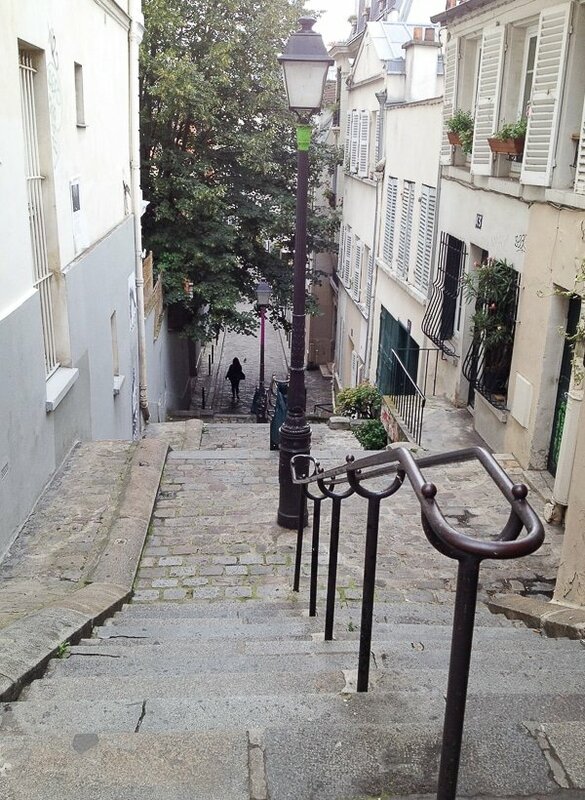 We spent our last day in Paris exploring Montmartre and all fell in love. It’s a beautiful neighborhood clinging to the vertical hill leading to the famous cathedral, Sacré Cœur, offering an incredible view of Paris. 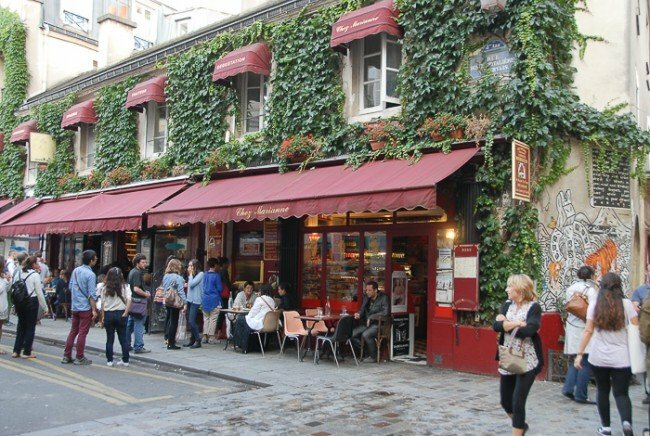 Though brimming with cafes we had our sights on one in particular which is housed in one of the two remaining windmills in Montmartre, Le Moulin de la Galette (the other is the famous Moulin Rouge). We dodged a powerful rainstorm spending the better part of the afternoon over a few carafes of house red wine, multiple courses of traditional French cuisine amidst historic black and white photos and Renoir. It’s a bit off the beaten track but worth the effort to seek out. 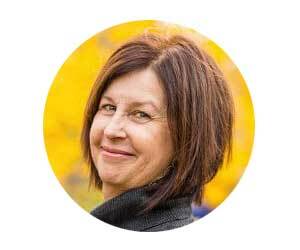 Cigarette Smoking in Paris: for Americans, especially those living in extremely health-conscious areas, the presence of cigarette smoking is a surprise. It’s everywhere so don’t be shocked. Smoking is currently permitted in outdoor cafes where tables are tightly nestled together. 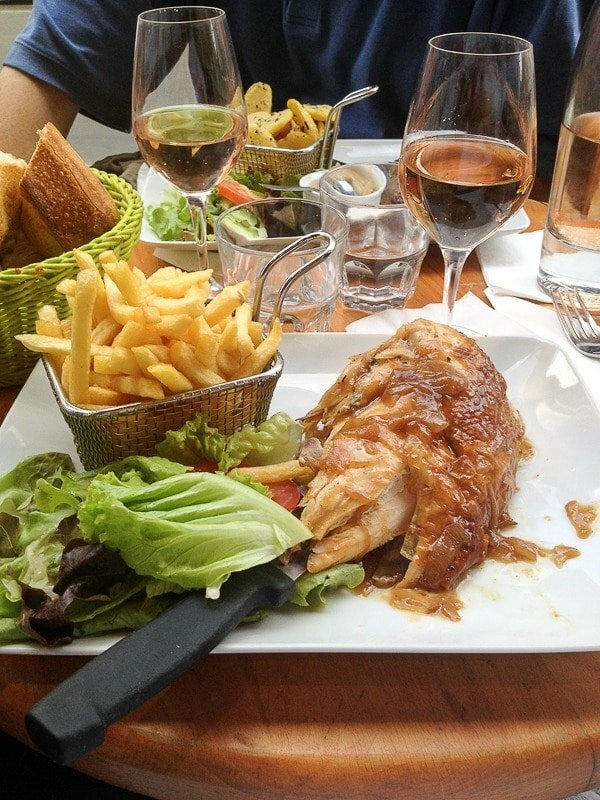 L’Ami Louis: Classic Bistro faire. Bistro de La Bonne Cécile: Recommended by a local ‘foodie’ at a favorite Marais neighborhood wine store Le Repaire de Bacchus, as a restaurant offering good food where locals eat (low on tourists). Café des Musées (Michelin Guide recommendation) A classic French Bistro with honest affordable food, highly recommended. 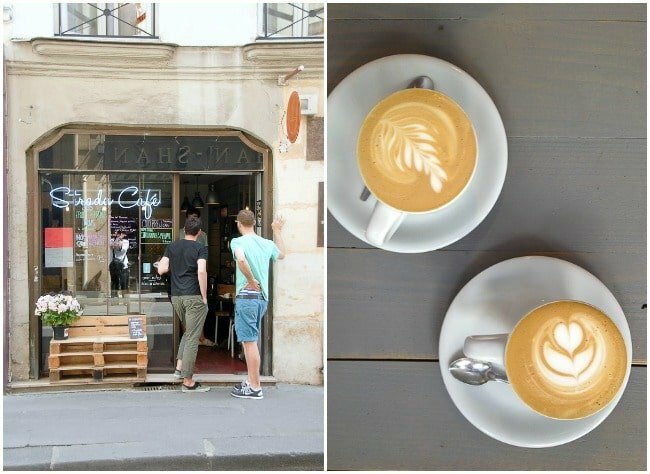 There is no shortage of cafes to stop for coffee everywhere in Paris. 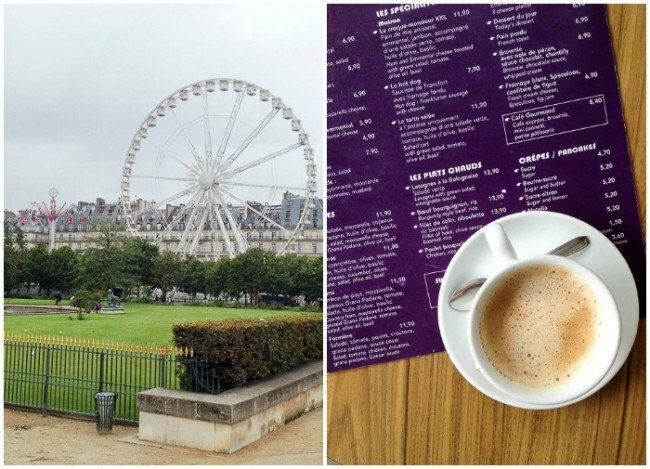 We dodged a rain storm while walking from the Louvre to the Arc de Triomphe at Cafe Diane in the Tuileries Gardens. Perched by a duck pond with a relaxing view of the gardens, it was a great spot to relax. Love this post! 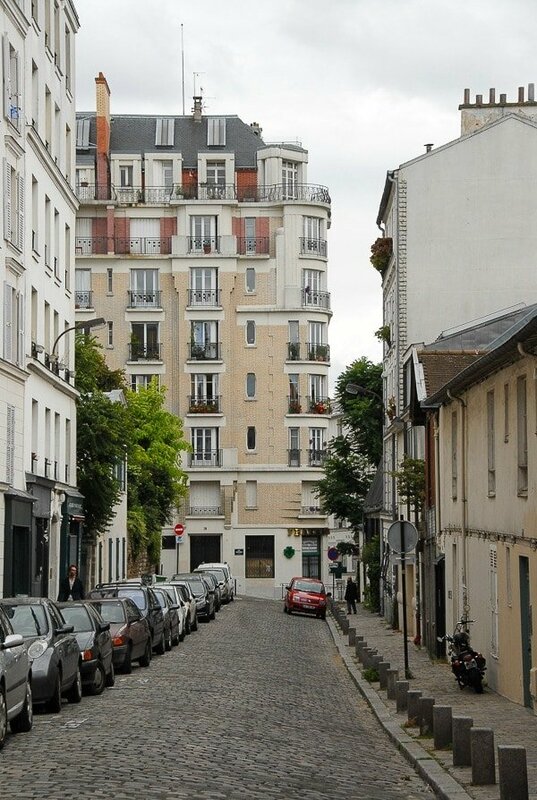 I know what you mean about only scratching the surface of Paris, what I’d give to live there for an extended time! Oh my heart always just twangs desperately when I see photos of Paris and this is no exception. It’s so lovely and entrancing! And so is that gorgeous citron presse! I need to get there soon!! Ah my favorite city in the world! I am lucky to go back every year and when I live in France (closed to Geneva) my hubby and I went every month. I love going in August (well I love going any month of the year!) and there are plenty of places that are open. Regarding your comment on smoking, I actually think it is getting better, and on my last trip in May I saw far more of the vapor cigarettes/e-cigarettes, but being from California any smoke bothers me too. I completely agree with you Andi on anytime is a wonderful time to visit. There is always something new to experience or familiar haunts to visit again. When visiting the mainstream tourists spots (as we did with our children) if there is a plan and expectations are realistic, you enjoy it for the opportunity it is! In Colorado, Boulder in particular, it is a shock to see anyone smoking anywhere and it is banned from all restaurants and bars now. 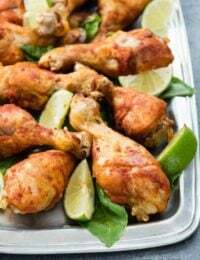 Having traveled a lot in Europe I really did not think twice about it but our children had never experienced such a thing; the person at the table an inch from you smoking during their meal! Part of realizing the world is different, right?! Me too Melissa! Hope you’ll love it too. Jealous of all this delicious food you had. Gah. 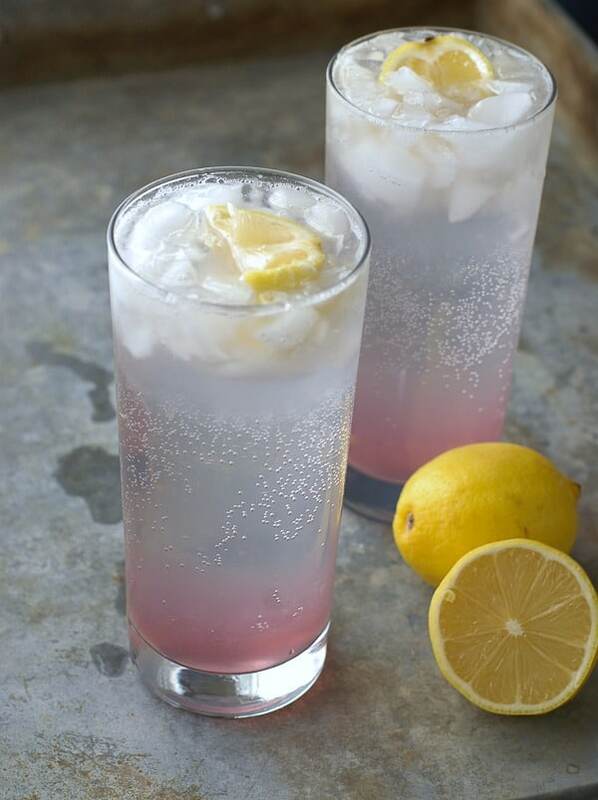 And that lemonade….perfect for a wedding or baby shower! Great tip for ordering water. We ran into the same issue on our last European trip. Bottled water is crazy expensive! All the food looks great! Bookmarking for future reference. what a wonderful photo tour of Paris Toni! Thanks so much for taking back to my favorite city!